Use this Choice 1.5 qt. stainless steel mixing bowl with its silicone non-slip base to add a great, useful addition to your kitchen. Featuring a thin coating of silicone on the bottom, this bowl is a step-up from your typical mixing bowls as the base stops the bowl from sliding around on your counter or workspace. This helps prevent common kitchen spills that can occur when stirring or moving about a busy kitchen. Plus, since the non-skid base is made of silicone it resists heat and chemicals better than plastic for long-lasting durability. This is sturdy and lightweight. The grip at the bottom is amazing so i have a bit of traction when furiously mixing icing colors. I only wish it had matching lids. 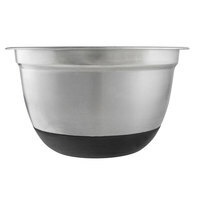 The 1.5qt stainless steel bowl with silicone bottom is the perfect small prep bowl. It's a little small for batters or dough, but perfect for whisking eggs and mixing diced or chopped items. The silicone base makes sure it doesn't slide around, even on a wet counter. I really like the non-slip base. I have both stainless steel and wood surfaces in my kitchen on my prep station, but regardless the bowl's base stays in place even when I freshly wipe down the stainless steel portion. This stainless steel bowl is great. I bought it mainly for the rubber bottom so it wouldn't slide across the table and it is great. I would recommend. This is a great mixing bowl for small jobs. I like that the sides are largely vertical, and the bowl is not so wide as most bowls. The non slip silicone base does a great job of helping the bowl not slip around on the countertop, and the mirror finish cleans up easily in the dishwasher or by hand. LOVELY ITEM I do love this thing, no joke. I need to find more, if there' any on here with a rubber bottom, I'm usually a quick stirrer or mixer and it slides all over the place but this one helps me manage my bowl while I'm trying to create in the Kitchen! Rubber bottom mixing bowls are the best! So much easier to use when they aren't sliding all over the counter. This smaller size is great for dips or premixing a few ingredients to add to a larger bowl. I absolute love this 1.5 Qt. Heavyweight Stainless Steel Mixing Bowl With Bottom Grip/Non-Slip Base. It's perfect to do the mixing and folding with one hand. The silicone base will prevent the bowl from moving. I would love to have a lid for this bowl. This bowl is adorable! i Love the small cute size its great for sauces, or for melting small amounts of chocolate Thank you for another great product! This bowl is pretty small but works great for whisking up eggs and small amounts of cream. These bowls are very thick gauge steel and feel really solid and well built. Fantastic mixing bowl. The sides have the perfect slope for easy mixing without making a big mess. The non-slip base is awesome, and they stack and store easily. I will be getting more in different sizes. What a wonderful stainless steel bowl. They have a very nice weight to them. They are very easy to control. For the rubber bottom keeps the bowl nice and stationary on the counter. They stack in each other nicely. Yes, they can be used over & over. They keep there beautiful shiny look without any dents or warping. The price is unbeatable. These bowls are great as a set. They nest nicely so can be put away all together. The non slip bottoms make the bowls very stable, no more chasing the stainless steel around the counter. The bowls themselves are made of a nice weight metal that seems like it will last a long time. I've switched to stainless steel mixing bowls for my daily use. I hardly ever reach out for glass ones anymore. They are so heavy. I particularly appreciate the non-slip base. I was expecting this to be a heavier material of stainless steel. This is made out of kind of a thin stainless steel compared to some of the heavier duty bowls that I have. If you use metal on this bowl they will scratch but that's not really a big issue and the rubber on the bottom will make marks on counters. This is a wonderful addition to your kitchen. I will never go without the non slip base again. It makes mixing thing so easy. Great price too! These bowls are great, particularly because the grip keeps them in place when you are working with them. The shiny exterior is great and the interior is strong and easy to clean. I have this in many sizes and love that they nest to store. I only put them in the top rack of the dishwasher and I always rinse them our after I use them to avoid having ingredients getting stuck on them. They do eventually scratch up with a lot of use, but that's inevitable. I'd recommend these. These bowls make a great salad bar ingredient bowl! I have a lot of them but they will rust if you don't let them dry before they are stacked. I have to admit that I have two sets of these mixing bowls in my home kitchen. I really like the 1.5 quart size - I find it useful for prep, serving, storage, pretty much anything. The bowls have enough heft to feel heavy duty but are lightweight enough to use in the kitchen all afternoon and stack with ease. I would definitely recommend purchasing one in every size because I know you will find them just as great and useful as I do. A great bowl, for mixing some of my firmer mixes. I don't have to worry about holding on to it, as the no slip bottom stays firmly in place as I am mixing with my hands. Great price for a product that will no doubt give me years of use. This is a very sturdy bowl. No sharp edges. The silicone base is easy to clean. It's an added bonus especially if you have more delicate working surfaces. Part of the set of non slip bottom grip bowls. They make all sizes and this is a great small small bowl for mixing and mashing. Great size for small applications and design of heavy duty high sided bowl. Love the non slip grip for working the contents on a counter. Will buy more! This is a really great bowl to have in your arsenal. It is just the right weight, sticks to the surfaces, and hold the right amount of small ingredients. Very sturdy and durable prep bowls, the non skid feature is great. I purchased these bowls in multiple sizes and they're quality are 2nd to none!!! great value!!! We love our stainless steal bowls with no slip bottoms. These bowls are sturdy stainless steel which makes clean up a breeze. Their well rounded bottoms are great for whisking egg whites as the bowls can be chilled, and perfect for folding those whites into batters. They stay put on the counter and are invaluable to us in our kitchen. I got this bowl, plus the 5 quart and the 3 quart ones, to replace an old set of melamine bowls. I like that not I'm getting any weird plastic chemicals in my food anymore. This is a review for the 1.5 qt. heavyweight stainless steel mixing bowl with its silicone bottom grip/non-slip base. I have used this for about 2 months now and it’s still sturdy as ever. I really love the silicone bottom grip/non-slip base because it has definitely made the mixing process easier and prevented a few spill in the kitchen so far. It is also very easy to clean and doesn’t have an oily feeling inside the bowl like how other plastic mixing bowls have after cleaning. Overall, I am very happy with this purchase and highly recommend this mixing bowl for beating eggs or for making small batches of baked goods. This bowl is great for mixing smaller ingredients together. We use it for spice mixes and whipping cream. The tall side walls are perfect for keeping everything contained. I have a set of three of these, they fit one inside the other and have that perfect combination of weight, balance and look- durability is perfect- they get a workout in my kitchen and are used several times a week- best of all they've got the grip base for just about any use. Love this bowl! We also bought the 5 QT version and love it equally as much. But this small one will be the one most used. As I stated on the review for the 5 QT, these bowls are heavy weight and of good quality. The non-slip base is an added bonus! I need several in this small size and will be buying them soon! I would give them 10 stars if I could! Great product. Price is quite cheap, and useful to have the non-slip base when mixing more stubborn things like doughs, etc. Cheap enough to throw around, but quality is good enough to take the abuse! Its is a lot deeper than the more shallow stainless steel bowls without the non-slip base, so if you need a deeper bowl, this would be a good one to pick. Personally, I do not need this, so I am considering replacing with the more shallow bowls. I love these heavyweight bowls. They grip tightly to the table because of the non slip base, and they also look good. In addition to using them just as mixing bowls, I use them to serve salads. They are tall enough that dressing and mixing your salad is easy and it won't spill over. This bowl is small and I like the deeper shape that it has which keeps batter or cream from flying while mixing. The first bowl I received was dented and Webstaurant's great customer service had a new replacement sent very quickly. The second bowl was actually heavier and nicer--I did find it interesting that they had two very similar, yet different products for the same item #. The non-slip bottom works great and the bowl doesn't slide around while using it. The non-slip grip on the bottom of this bowl is awesome! It makes mixing vigorously so much easier. This bowl nests nicely with the other sizes as well. Why use a big bowl when a small bowl will do. This is a sturdy bowl and the non-slip base is a bonus when mixing stiff ingredients. The perfect sized stainless steel bowl for beating eggs, butter, and other ingredients in small amounts. The nonstick grip works well and prevents accidental slips. Good for light duty baking needs to measure out ingredients before combining. It's nice to have a non slip bottom when you have stainless steel counters and they are constantly wet. Just one little step to make things go smoother. Really nice, heavy weight stainless steel mixing bowl. The stainless is very durable and the nonstick bottom really comes in handy when mixing. The size is really great for working with small batches of food. The 1.5 qt. heavyweight stainless steel mixing bowl with bottom grip / non-slip base is extremely sturdy. It is also very attractive. It was a little smaller than I expected, but I will be purchasing more in different sizes and it will be part of a great set! A nice sized bowl great for mixing up muffins or other batters. The non slip base is great and allows me to mix with both hands. These bowls are great for baking. They allow you to mix batters without having the bowl slip. It works well for making emulsified dressings and sauces where you need both hands.